my 2 months old gsd isnt ready to learn to potty outside, i take him out as soon as he is done with his meals but he keeps on sniffing and playing with the grass. when i get him inside he does potty over there...what should i do? First of all you have to be patient. Your puppy is just a tiny baby and it's little bladder isn't ready to go long periods of time without being emptied. If it plays a bit, let it, and just hang in there until it "goes" - then praise, praise, praise it. Potty training is very important. Eventually through repetition it will make the connection between going out and using the bathroom IF you're consistent in providing it the opportunity. Also, you need to go to the same spot each time to make the connection stronger. 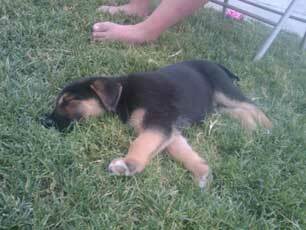 So, with that in mind, make sure that you take your GSD puppy out after it wakes from each nap, immediately after each meal, if it seems to be looking for something in your house and circling around (a common sign that your puppy is looking for a place to go), etc. You'll learn to read your German Shepherd puppies signs that it has to "go" eventually. Make sure that you are super careful during this potty training to be patient and vigilant - otherwise you are just setting yourself up for a much longer potty training period. Below is a great potty training course if you want more info, tips and tricks on how to do potty training best. Just hang in there though. And be patient.